V2 - same sound - smaller box! Thorpy FX - The WARTHOG Distortion V2The WARTHOG started off being designed to be the distortion to beat all others; however it ended up being so much more. V2 - same sound - smaller box! The WARTHOG started off being designed to be the distortion to beat all others; however it ended up being so much more. 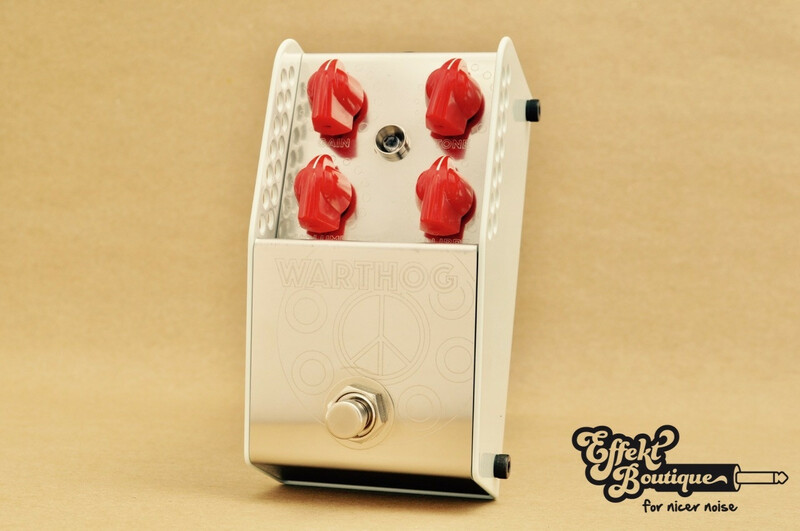 Through minute tailoring of the circuit, the WARTHOG delivers the biggest range of tones of any overdrive/distortion pedal on the market. With an ability to go from crystal clean boost through to distortion the WARTHOG has sonic characteristics that match the military prowess of its namesake. Its tonality is firmly in the American camp with sparkling cleans similar to the best amplifiers in that genre, With the calibre and gain controls cranked you get a crushing distortion with fuzzy overtones at the very extremes of travel. All settings are extremely addictive, with a 3 dimensional and complex sound that makes your playing jump from the fretboard.